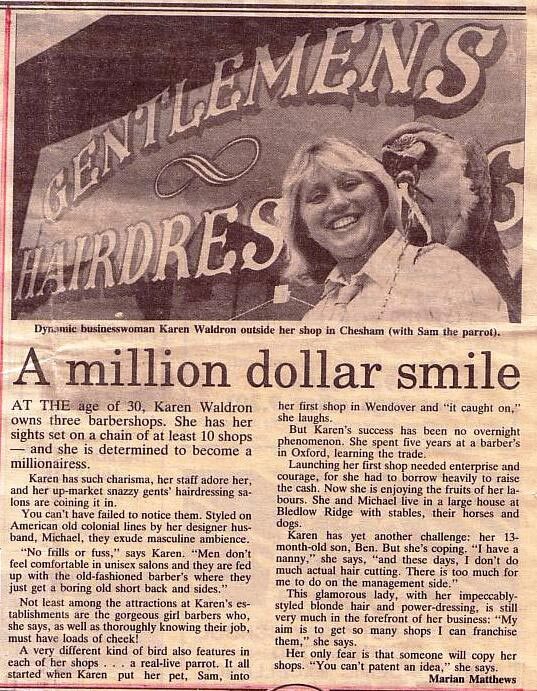 At the age of 30, Karen Waldron owns three barbershops. She has her sights set on a chain of at least 10 shops – and she is determined to become a millionairess. Karen has such charisma, her staff adore her, and her up-market snazzy gents’ hairdressing salons are coining it in. You can’t have failed to notice them. Styled on American old colonial lines by her designer husband, Michael, they exude masculine ambience. Not least among the attractions at Karen’s establishments are the gorgeous girl barbers who she says, as well as thoroughly knowing their job, must have loads of cheek! A very different kind of bird also features in each of her shops… a real-live parrot. It all started when Karen put her pet, Sam, into her first shop in Wendover and “it caught on,” she laughs. But Karen’s success has been no overnight phenomenon. She spend five years at a barbers in Oxford, learning the trade. Launching her first shop needed enterprise and courage, for she had to borrow heavily to raise the cash. Now she is enjoying the fruits of her labours. She and Michael live in a large house at Bledlow Ridge with Stables, their horses and dogs. This glamorous lady, with her impeccably-styled blonde hair and power-dressing, is still very much in the forefront of her business: “My aim is to get so many shops I can franchise them,” she says. Her only fear is that someone will copy her shops. “You can’t patent an idea,” she says.